Earlier this year I wrote about LED Glasses that Help Restore Sight, developed by neuroscientists at Oxford University that allow visually impaired wearers to see once again. Recently, as reported by the mainstream media, the medical science made some progress in helping individuals with age-related blindness. About 1.5million people suffer from such blindness, so, you may be interested in reading on. 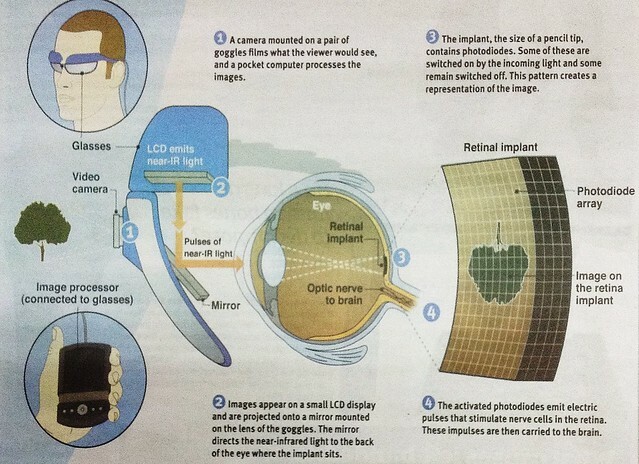 Scientists at Stanford University School of Medicine in the US have invented an implant that could help the blind to see. The implant, which sits at the back of the eye, would help patients suffering from diseases in which photoreceptors cells in the retina slowly degenerate. It acts as an artificial retina, taking information from the outside world and converting it into electrical signals which a fed to the brain. Several other 'bionic eye' systems have been developed previously, all of which have required coils, cables or antennae to be embedded in the eye to deliver power and information to the implant. But in this new system, near-infrared light is beamed to an implant made up off light-sensitive diodes. These convert the light into an electric current that's fed to the existing retinal nerves, reducing the amount of electronics that need to be embedded in the eyes. "To make this work, we have to deliver a lot of more light than normal vision would require. If we used visible light, it would be painfully bright." says Associate Professor Daniel Palanker at Stanford. Near-infrared (near-IR) light was the answer - it isn't visible to the naked eye, but it can be detected by the implanted diodes. So far, the implant has only been tested on rats. But it has the potential to treat both age-related macular degeneration, the leading cause of blindness in the UK, and retinitis pigmentosa, which affects 1.5 million people worldwide. In both conditions, the retina's photoreceptor cells degenerate but the nerve cells in the retina, on which the 'bionic' implant relies, remain intact. TheGreenMechanics: Let's hope that technological advancement is for the good of mankind, and not a showcase of military muscle that will eventually lead to confrontation. Source: The Daily Express Weekend Companion, September 30, 2012, pp 13.